Rebecca Kinburn has considerable experience in complex business litigation. Her experience includes a broad range of matters in court, arbitration and administrative proceedings, including bankruptcy, securities litigation, patent litigation, white collar representation and general commercial litigation. Rebecca's notable business litigation experience includes representation of financial institutions in securities litigation matters stemming from the 2008 financial crisis, representation of a pharmaceutical company in defending at trial a $100 million damages claim after an infringement finding, and representation of corporate clients in disputes in fraud, breach of contracts and breach of fiduciary duty claims. She has worked on several high profile bankruptcy litigation matters, including a breach-of-contract claim related to the reorganization of a multibillion-dollar hotel and entertainment company, and the liquidation of a multibillion-dollar, global technology company. 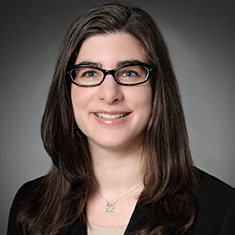 Rebecca has represented clients in financial services matters involving various regulatory bodies including FINRA, the SEC, the CFTC and the Department of Justice.